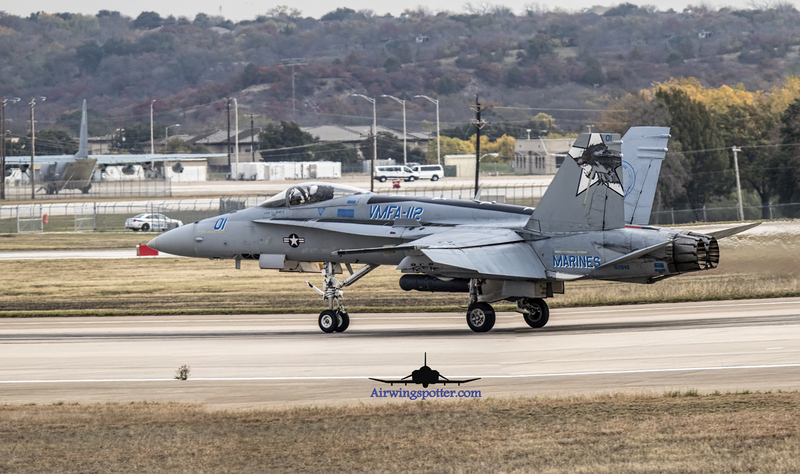 Cowboy 3-1 and 2 was heard over the radio chatter and here came 2x F-18A++ from our local units VMFA-112 Cowboys. They did instrument approaches and landed on Runway 36. The best thing of this catch came from the Boss bird in full color and also my 1st catches in this markings. T38C from Sheppard and Laughlin AFB was shooting approaches and Lockheed Martin Rocket 1-1 decided to come out to play. The Lockheed F_16C chaser came out and did some unrestricted climb in Full Afterburner take off. ON her landing she did a few low level pass for runway 36. Catching visitors coming to KNFW is always welcome for us spotters and today is no exception. We’ve got 4x MV-22B VMM-764 Moonlighters including the color bird. They call for 3 ship departure coming out from taxiway “C” for runway 36. Unfortunately the Color bird broke down after a few attempts to take off. All in all, 3 V22 came out and taxi back twice before aborting the entire launch. I was told that 2 of the V22 did take off while the broken Color bird is still in the base. Pingback: Birds and USMC birds!